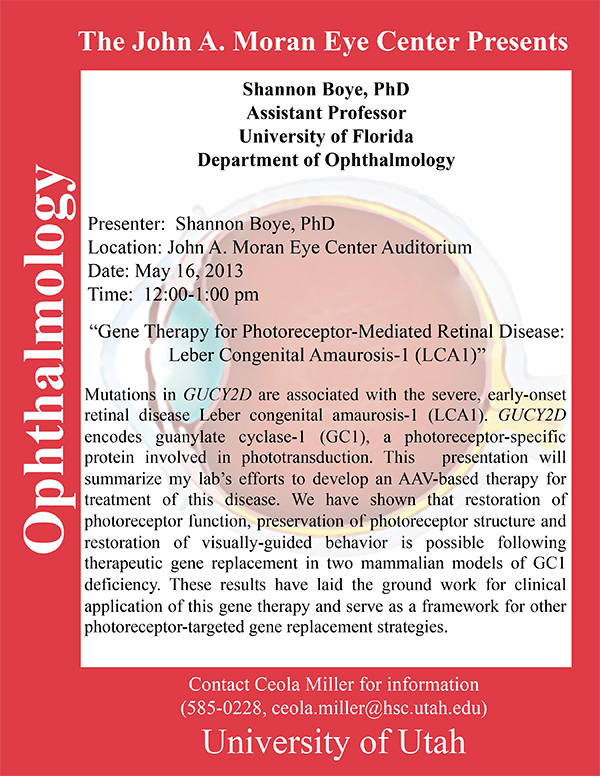 Mutations in GUCY2D are associated with the severe, early-onset retinal disease Leber congenital amaurosis-1 (LCA1). GUCY2D encodes guanylate cyclase-1 (GC1), a photoreceptor-specific protein involved in phototransduction. This presentation will summarize my lab’s efforts to develop an AAV-based therapy for treatment of this disease. We have shown that restoration of photoreceptor function, preservation of photoreceptor structure and restoration of visually-guided behavior is possible following therapeutic gene replacement in two mammalian models of GC1 deficiency. These results have laid the ground work for clinical application of this gene therapy and serve as a framework for other photoreceptor-targeted gene replacement strategies.